The incidence of cataracts in farmed salmon is on the rise due to vegetable-based feeds, a strong focus on fish growth and warm waters. "This is a condition we can do something about," asserts Sofie Charlotte Remø. Ms Remø, a researcher at Norway's National Institute of Nutrition and Seafood Research (NIFES), is studying this eye disease for her doctorate. In salmon, the gradual clouding of the eye lens caused by cataracts makes it difficult for fish to find their feed. The condition results from insufficient amounts of the amino acid histidine, replacing fish oils with vegetable oils in feed, rapid growth and warm ocean temperatures. "To prevent the development of cataracts after the salmon have been put to sea, they need more histidine than is needed for growth alone," explains Ms Remø. "Up to now, histidine levels have been based on their growth requirements. Cataracts as a fish welfare problem in aquaculture can be prevented by putting more histidine in the feed." Farmed salmon need extra histidine to build up the level of N-acetyl-histidine (NAH) in the lens of the eye. NAH inhibits cataracts through its antioxidant properties and osmolytic effect (regulating the balance of fluids in the lens). Ms Remø has also been studying whether increased use of vegetable oils in salmon feed and warmer seawater temperatures raise the risk of developing cataracts. "The salmon eye lens is only slightly affected when the feed contains fatty acids from vegetable rather than marine sources," continues Ms Remø. "But the vegetable oils do affect lens genes that control the defence against cataracts." Feeds with more vegetable-based ingredients may make salmon more susceptible to developing cataracts in conjunction with certain external factors, such as warmer ocean temperatures. More research is needed to determine how great a risk is involved. Since fish are cold-blooded, their metabolism and growth are affected by marine temperatures. In recent years, seawater temperatures have exceeded 18°C in several areas along Norway's western and southern coasts. During these warm spells the fish use more of their feed for maintenance of bodily functions rather than growing. "Their histidine requirement is higher in seawater than in fresh water," says Ms Remø, "and sufficient histidine is especially important in higher temperatures." Her trials show that smolts develop cataracts very quickly when there is too little histidine added to their feed. 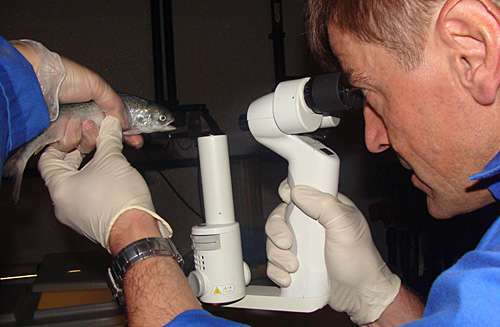 In the course of one month in seawater, her 70-gram smolt subjects developed cataracts that were so serious they would lead to difficulty in finding feed and growing to slaughter size. Compared to salmon, rainbow trout are able to produce more NAH and are thus less susceptible to the disease in higher seawater temperatures.